I need to go to Urban Outfitters more often...well maybe I shouldn't. I've been going weekly lately, because some of my friends wanted some of their holos. Every week I've gone they have a new polish out that wasn't there the week before. What's even better than that is it's always some awesome polish or some polish that seems very familiar to something more expensive. I spotted this polish the other week, and it reminded me a lot of Deborah Lippmann Ray of Light. Is it a dupe? 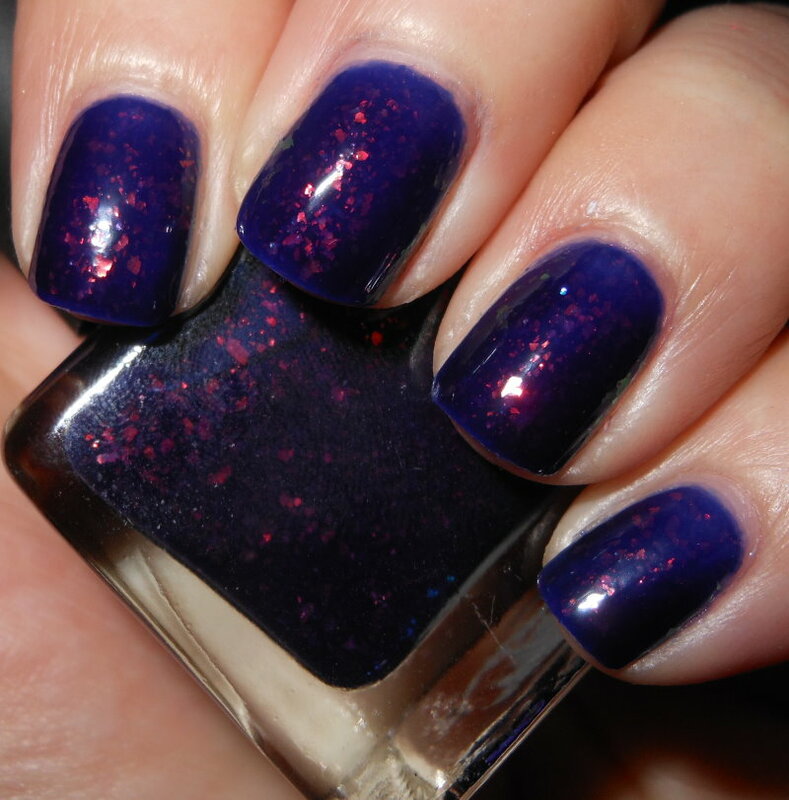 Mystic is a deep indigo blue that leans slightly blurple jelly with coppery pink flakies. The flakies in the bottle in person look iridescent, however, on the nail and when photographed the iridescent color flash doesn't not really show. The flakies on most all accounts here will look coppery pink. The formula on this was a bit sheer, but buildable. The photograph makes it look more sheer than it does in real life. 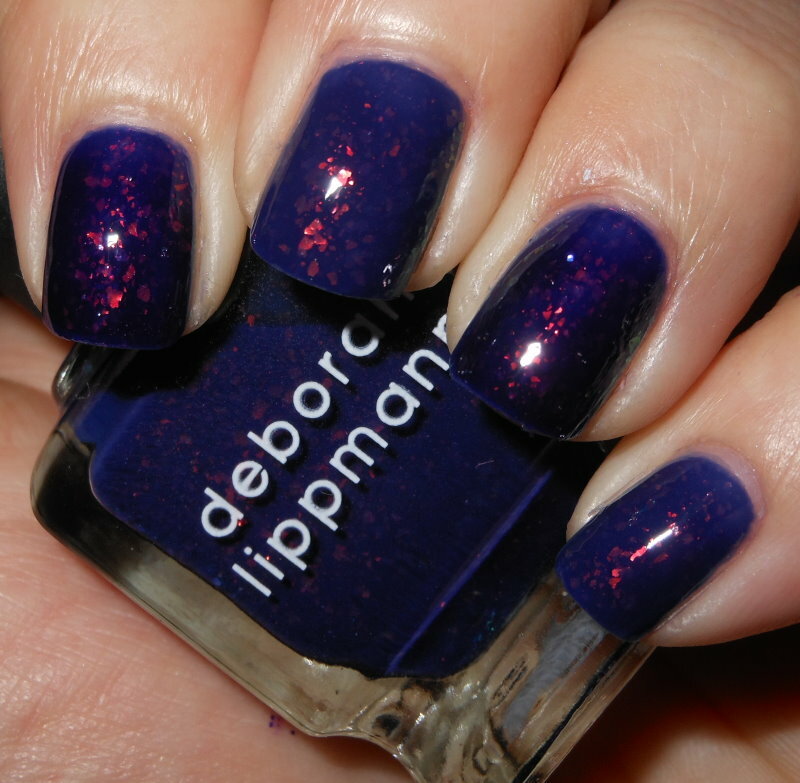 This is a great deep jelly shade with gorgeous flakies. These are not dupes, but they're close. Below I have listed the bullet points of differences and similarities. Base color is different. UO is darker and leans more purple than the DL. If you want something similar to DL Ray of Light, but don't want to pay the DL price I think UO is a good alternative. These are not dupes though, but they are very similar If you have DL Ray of Light, and you're happy with that I wouldn't say you need UO Mystic unless it appeals to you too. I think if you have the DL already, you will prefer that formula to the UO. Pretty! I've been seeing more and more swatches of UO polishes. I think I may need to stop by my UO. They're close enough to me to call them a dupe. I wouldn't buy any DL for that reason. I need to visit the Millenia Mall more often to see what UO has. I've restricted myself for the rest of the year but might have to break that commitment to get some of these. I love the UO even more! Wish they sold this here :(. These are pretty much spot on IMO. I got Mystic last week and I love it. I actually think it's prettier than Ray of Light since the flakies are a tad more visible. Nice! I wish the Urban Outfitters here in UK got the same stock!! Mystic is gorgeous! I'd be satisfied with it. I should really go to UO sometime soon. OMG! I am def going to have to hit up my Urban Outfitters for this! !